Yeah, yeah, I know. The words Low Calorie and Chocolate Brownie being used together in a sentence seems like a bit of an oxymoron right? 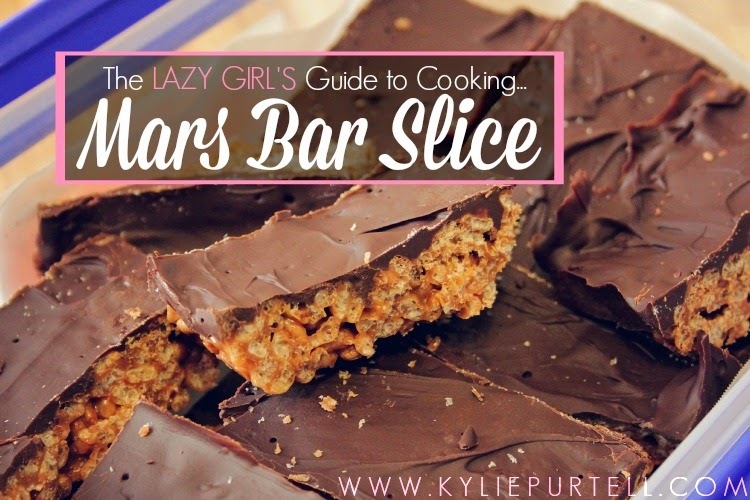 And if you ate one of these every day it probably would stop being guilt-free! But something I've learned about myself, while undertaking Operation Lose Baby Weight, is that I need to treat myself every once in a while. And this is the perfect way! 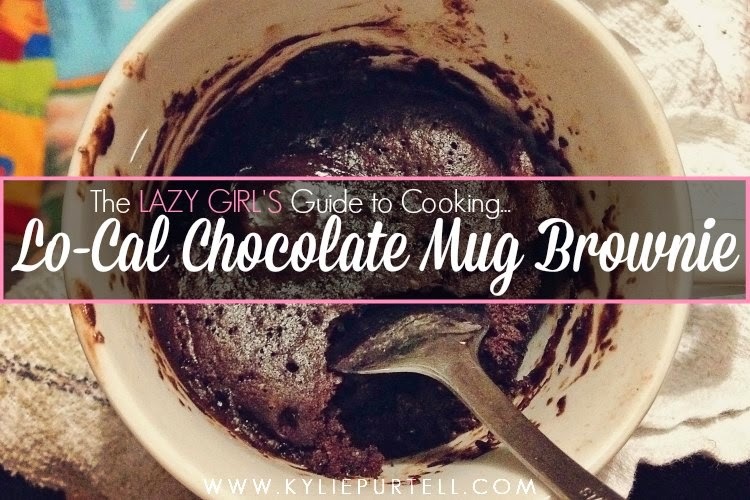 With this Chocolate Mug Brownie you can have the pleasure, without the side-serving of guilt that usually comes with it! As you can see, I adapted the recipe slightly as we had no low-fat plain yoghurt, so I substituted milk instead. I also didn't bother with the salt. I probably used around 2-3 tablespoons of milk, but I only added it one tablespoon at a time. You really need to add just enough to mix all the dry ingredients together. Once I'd mixed all the ingredients together directly in the mug I whacked it in the microwave for a minute and found myself faced with the pleasure of a glorious, chocolate brownie in a mug! The top had a nice cake-like consistency while the bottom was still a little gooey, just like a chocolate brownie should be. I didn't have any ice-cream with mine as A) we didn't have any, and B) the gooey bottom provides enough "wetness" to get away with not having any. 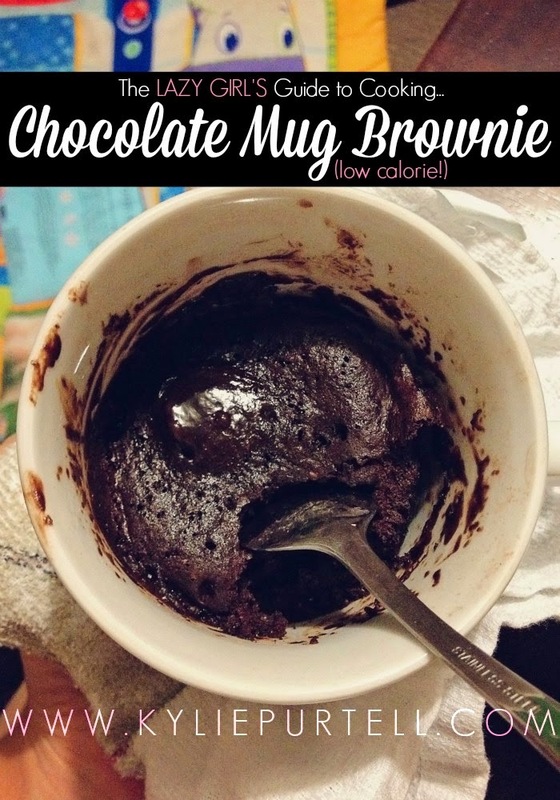 So there you have it, a relatively low-calorie chocolate mug brownie. I will continue to experiment with this recipe and try it with almond meal in place of flour, and if I can ever be bothered to find somewhere local that sells it, cacao powder, as according to all the cool kids, that's the stuff to have! Have you found any decent mug cake/brownie recipes lately? What's your guilty pleasure? That could be dangerous for me....good thing it's low cal....ish. A cakie thing in a cup? Very, extremely dangerous for me! Actually it might be a good thing if I had this and stopped having all the other fattening ones. ooo that sounds delicious! I was only thinking the other night how stupid it is that most mug cakes contain melted chocolate. If I had chocolate then I wouldn't be raiding my pantry trying to make a mug cake! Thanks for linking up with us at The Lounge. I will be trying this as soon as the cooler nights turn up! Have you seen the quiche in a mug? I love mug desserts. And lazy girl options. Perfect! Will have to try soon.